Notes: Requires 3.42:1 axle ratio, Z82 Trailering Special Package, automatic transmission, engine-oil cooler, transmission-oil cooler, heavy-duty battery, weight-distributing hitch. Maximum tongue load 750 lbs. Gross trailer weight for 4WD must be reduced by 1000 lbs. if P235/75R-15 tires are used. 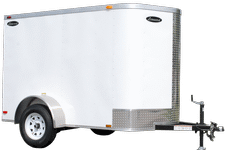 Maximum gross trailer weight includes passengers and cargo in the tow vehicle plus any cargo in the trailer. The additional weight must be subtracted from the maximum tow rating.